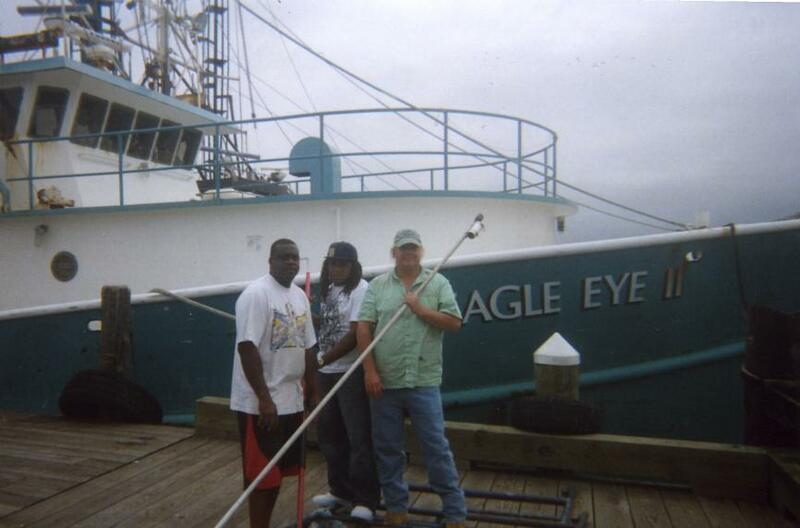 Captain Scott Drabinowicz with crew holding the tagging stick in front of the FV Eagle Eye II. AMHERST, Mass. – A first-of-its-kind study of bigeye tuna movements in the northwestern Atlantic Ocean led by Molly Lutcavage, director of the Large Pelagics Research Center at the University of Massachusetts Amherst, found among other things that these fish cover a wide geographical range with pronounced north-south movements from Georges Bank to the Brazilian shelf, and they favor a high-use area off Cape Hatteras southwest of Bermuda for foraging. This NOAA-funded research, which used a new approach to study one of the most important commercial tuna species in the Atlantic, provides the longest available fishery-independent record of bigeye tuna movements to date. Data should help researchers to further characterize habitat use and assess the need for more monitoring in high-catch areas. Results appear this week in an early online edition of the Canadian Journal of Fisheries and Aquatic Science. Two earlier electronic tagging studies by others yielded relatively short tracking data, 113 days or fewer, and did not allow for seasonal analysis of movement or exploration of an alternate stock composition hypotheses, Lutcavage and colleagues note. Bigeye are currently managed as a single Atlantic stock, she explains, and the greater resolution of habitat use and migratory behavior revealed in this study are important first steps towards determining whether or not a more complex management approach may be warranted. 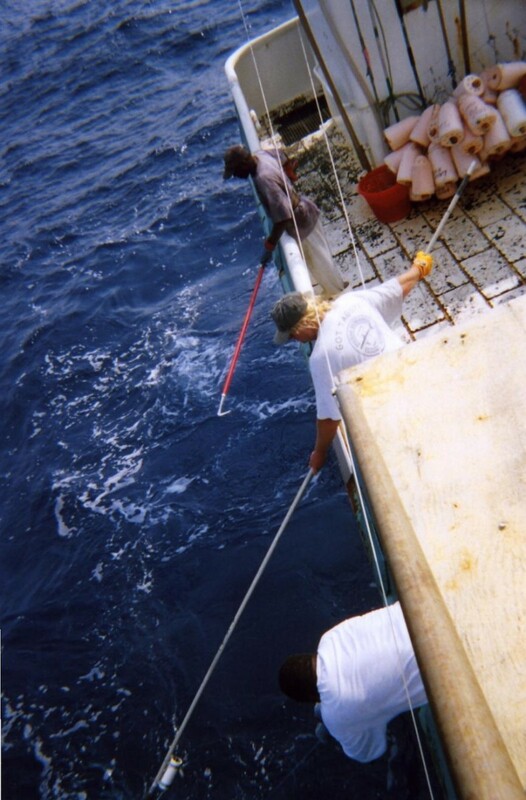 Pelagic longline vessel Captain Scott Drabinowicz and crew preparing to deploy a tag from the deck of the FV Eagle Eye II. Working with pelagic longline vessel captains Scott Drabinowicz and John Caldwell of the FV Eagle Eye IIout of Fairhaven, Mass., Lutcavage, with LPRC colleagues Tim Lam and doctoral candidate Ben Galuardi, deployed 21 pop-up satellite archival tags (PSAT) on adult bigeye tuna between 2008 and 2010 in the northwest Atlantic. The sea captains fit tags on fish in good condition and return them to the sea. The PSATs were programmed to record relative light level, temperature and pressure (depth) every two minutes for eight or 12 months. Lutcavage, Lam and Galuardi were able to collect full-resolution time series data from a total of nine tags, providing data ranging from one to 292 days. The team also downloaded remote sensing and climatological information from the NOAA to characterize possible associations between bigeye tuna movement and behavior and environmental factors. Among variables they analyzed were the bigeyes’ use of the deep scattering layer for foraging. That is an ocean layer of marine life that rises and falls in relation to diurnal vertical migration. The researchers also looked at lunar influences on swimming depth, horizontal movements, plus vertical activity and factors influencing it such as temperature. The authors hope their results will inform the International Commission for the Conservation of Atlantic Tuna’s upcoming tagging effort and assist ICCAT scientists as they plan new research to better understand the population. Alain Fonteneau, an emeritus scientist at France’s Institut de Recherches pour le Développement and a recognized expert member of scientific panels that manage regional tuna fisheries worldwide, called this work “fantastic.” He says, “Although we don’t see major unexpected surprises in these results, as we often see with Atlantic bluefin tuna results, this paper is the first one in the scientific literature to provide very new and very interesting results on bigeye vertical and geographical movements in the western Atlantic,” he points out.